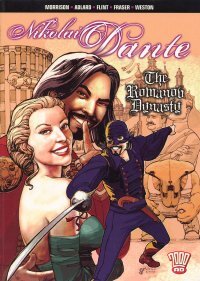 Includes covers of Progs 1035, 1039, 1044, 1074, 1080 & Nikolai Dante: The Romanov Dynasty as published by Hamlyn, plus a sketch page featuring Jena Makarov and Nikolai Dante. Future Russia, where the Tsar rules a world empire with an iron fist. His nobles conspire against him for their own advantage, and everyone's on the take. 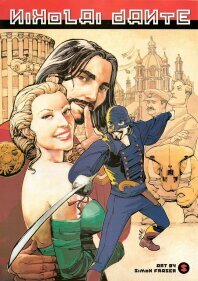 This Flashman-style tale of Russian swashbuckling revitalised 2000AD. And with hindsight it's easy to see why. Writer Robbie Morrison (Batman, The Authority, Shimura, White Death, Shakara) and artist Simon Fraser (Judge Dredd, Hellhouse, Shimura, Family) created an anti-hero that stood out as a fully-fleshed character from the first moment he appeared on the page (and incidentally contrasted nicely with the tough guys who make up the majority of comics heroes). Book II, Tsar Wars, may have more emotional impact, but it means nothing without this enjoyable romp that sits just the right side of parody.